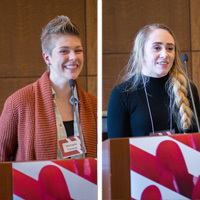 Ten Graphic Design students presented their digital and print portfolios at the annual Graphic Design Showcase, held Dec. 2 in the East Academic Building's Edward Jones Commons. Local designers, art directors, and human resources representatives with an interest in design were also on hand to critique their work and answer students' questions. This was an excellent opportunity for Graphic Design students to network with local professionals--many of whom are alumni--as well as receive feedback on their design work from experts in the field. The showcase featured the work of students Sarah Boudreau, Bridget Carey, Anna Cruzen, Jenni Fetcho, Michaela Finnerty, Jake Hunn, Eva Ju, Justin Smith, Farah Tinnemeyer and Severin Watson. Click here to view more photos of the Showcase. Graphic Design students presented their digital and print portfolios at the annual Graphic Design Showcase on Dec. 2. Faculty members, staff, alumni, prospective students, and other Webster students were also in attendance. Prospective students had the opportunity to tour the graphic design studios and meet with faculty and staff of the department. The Showcase was sponsored by Almanac. Founding partner and creative director, Nate Sprehe, also a Webster alumnus, judged all the portfolios, awarding the Almanac Award to Michaela Finnerty. Tom Lang, Professor and DADAH Chair, awarded Bridget Carey with the Tom Lang award.